If you are a single adult, you’re seeking to understand yourself and your place in the world. Every single wrestles with values, morals, relationships, and meaning. At the heart of this pursuit is the need as an unmarried person to give and receive emotional love. Whatever the category, as a single adult you want to feel loved by the significant people in your life. You also want to believe that someone needs your love. Giving and receiving love is at the center of the single adult’s sense of well-being. If you feel loved and needed, you can survive the pressures of life. Without love, life can become exceedingly bleak. Rob illustrates the power of love when one is almost overcome by the problems of life. I first met Rob on one of my trips to the Grand Canyon (which in my opinion is one of nature’s most beautiful portraits). On the south rim of the canyon, somewhere near the Bright Angel Trail, I spotted Rob and two older adults. He was not hard to spot, because he was wearing a back brace with a metal halo that circled his head. I gave him a friendly nod and a smile, my way of saying hello. Rob responded, “Hello, I hope you’re having a good morning.” His smile was inviting, so I entered into conversation. I discovered that he had suffered spinal injuries in a hiking accident. The older couple was his mom and dad. The three had planned a family trip to the Grand Canyon two years earlier. The first year money was a problem, so they postponed their dream. Then Rob had his accident and they couldn’t leave home. Now that Rob was doing somewhat better, they had come to see the canyon. When they originally had planned the trip, they intended to hike to the foot of the canyon. Their dream had been altered but not destroyed. So they planned to spend the week enjoying the sights of the canyon. Rob had wheeled his chair into position for a great view of the trail and canyon, and he and his parents were soaking in the fabulous view. I commended them for not giving up on their dream and wished them well. My son and I continued our week together exploring the canyon. Toward the end of the week I ran into Rob in the lobby of the Bright Angel Lodge. Because of our earlier encounter, it seemed I was seeing an old friend. We ended up talking for two hours. Rob shared his story about the fall that resulted in his injuries and the determined efforts of the rescue workers who flew him out by helicopter. He told me about the pain and the emotional struggle of those early days when he wasn’t sure he would ever be able to walk again. He had a number of brushes with depression, had lost a job opportunity which he was pursuing at the time of the accident, and spent many weeks in physical therapy. When I asked what had enabled him to come through that experience and still have such a vibrant spirit, his answer was simple. “Love,” he said. “That’s the only way I could have made it. Mom and Dad were with me through the whole thing, and I had a girlfriend...not a romantic relationship, but a close friend who came to see me every day in those early weeks. I don’t think I would have made it without her. She brought me hope. She encouraged me in my therapy, and she prayed with me. I had never had a girl pray with me before. There was something about the way she talked to God that gave me hope. Her words were like rain on my parched emotions. 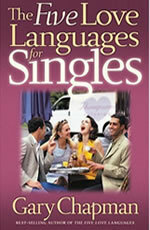 Taken with permission from The Five Love Languanges for Singles, Northfield Publishing, copyright 2004 by Gary Chapman. Order your copy of The Five Love Languages for Singles at Shop CBN.